Screens by Shenzhen Leyard Opto-Electronic appeared at the Frankfurt Auto Show this year. What remains the same as in previous years is that various top automobile companies around the world got together to show the changes that their latest technologies and design have brought to people's lives. What's different is that the way of expressing that has improved radically. Mercedes-Benz’ smart design leads the concept of combining human and automobile. Mercedes-Benz first set the standard minimum distance of ultra HD LED screens in the SMART exhibition hall. The display effect of small distance LED screens, which are frameless, seamless and have high definition as well as high brightness, demonstrates the whole concept of SMART. 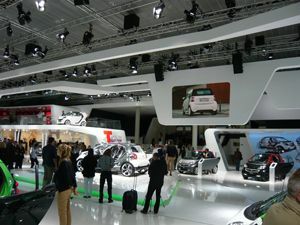 In traditional auto shows, celebrations or stage performances, people often choose the P6 display screen. In recent years, high-end rental companies have begun choosing P4 so as to enhance the screen resolution because of the development of industrial technology in LED screens. Nevertheless, even P4 cannot solve the contradiction that the screen is limited by the size and height resolution of the screen. Despite this, Leyard’s 1.9 HD screens have made full HD and 4K possible. Germany LANG company has purchased one 4K P1.9 screen from Leyard for a top international event, and Mercedes-Benz used it at the Frankfurt Auto Show.